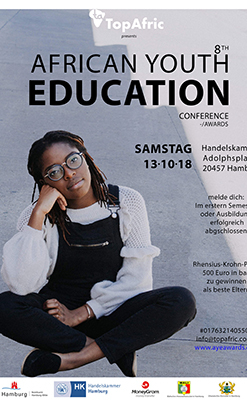 I had the privilege to attend the 2016 African Youth Education Awards (AYEA) in Hamburg which for me belongs to one of the well-organized events by the African Diaspora in Hamburg. In terms of event management, the African Diaspora has constantly been linked to a clichee of disregard for time, ill-prepared programs, less attention to detail and unprofessionalism. Traditionally, one can also argue that most African communities in Germany have placed much focus on socio-cultural programs (Outdoorings, Funeral Celebrations, Cultural Shows, etc.) to highlight their existence in the public domain. I humbly want to proclaim that the AYEA program is now one of the leading platforms to showcase a different image of the African Diaspora in Germany. The organizers of the AYEA have clearly understood that the regard for punctuality directly translates into respect for participants and also lays the foundation for effectiveness. The program started on time - which was the first surprise I took notice of- and it was executed within the allocated time. This brings to mind that I have to give a big credit to the 3 young African female moderators who combined glamour, professional expertise and resolute assertiveness to drive this event to the expected targets. The AYEA program was patronized by signficant personalities from the Hamburg Chamber of Commerce, representatives from the Hamburg Local Government, Embassy of Uganda, Notable Parliamentarians, Student Associations and many more distinguished individuals. For me, this platform delivered the ever so important avenue for vital engagements between the political divide in Germany and the African Diaspora. The presentations stressed the need for the African Diaspora to consolidate its position within the society at large by taking advantage of all integration avenues. At the same time, the awards to our young African brothers and sisters can be seen as powerful motivation factors, however, I am of the view that they clearly depicted an increasing trend of the African youth walking a different path in comparison to the older generation. Specifically, this is an indication that they have embraced the idea that achieving excellence in education is a core prerequisite for career development and social integration in Germany. The event sequence combining formal presentations, entertainment acts and motivational speeches were driven in a manner which captured my attention from beginning to end. Boredom factor was zero and I believe this is achievable through experience which the organizers have gained in the last couple of years. Unfortunately, Africans (both on the continent and in the diaspora) have never had the joy, resources and the platform to write and communicate their own history (culture, religion, traditions, etc.) to the rest of the world. This role has often been occupied by foreign media, especially western media who, evidently, have always presented Africans in the light of their own expectations, imaginations and purposes. Going forward, this situation has to change and the AYEA showcased that this is a viable avenue for the African Diaspora to tell its own story. As a Professional Project Manager, I could see that a lot of planning, time, resources and engagements have been invested into this event or I'd say project. The outcome was simply remarkable - participants neither noticed any technical issues nor logistical challenges. On the other hand, I thought the representation and involvement of the African Diaspora in Hamburg leaves much to be desired. Yes, more hands on deck! Hamburg has the largest number of Africans in Germany and I am convinced they could put more resources together to expand the dimensions of this event. I'd also expect to see more African businesses in Hamburg taking up the role of sponsors for this event. The Union of Ghanaian Associations in Germany (UGAG) e.V. has through Mr. William Nketia (President) confirmed their participation. They will be in to observe the elections. Following the recent tragic occurrence in Sierra Leone's capital, Freetown, TopAfric as a media house has decided to fulfill it's social responsibility with the help and support of the African community. We therefore wish to humbly bring to the notice of the whole African community, the TopAfric intiative "SUPPORT THE SURVIVORS OF SIERRA LEONE MUDSLIDE". This initiative is intended to gather items that will be of immense help to over 3000 people that displaced and left destitute after the disaster-struck in Sierra Leone. Sources however have it that, the country is likely to experience the same tragic incident that happened on the 8th of August 2017 in the capital. Currently, residence living in buildings constructed on the "Mountain Side" are being propelled to relocate to avoid any of such tragic incident that claimed over 400 lives, leaving others missing. One will say, the survivors are very lucky. But really, what did someone who lost 28 members of her family survive for if they will live the rest of their lives, suffering? What would a survivor who has lost his/her home and everything they ever worked for in their lifetime, live on? How will a country whose economy is not buoyant enough to cater for all survivors? However sad or heart-rendering it might sound, there is a way out, if only the African community will sympathise and donate anything they can to make a difference. TopAfric is therefore appealing to churches, groups and the African community in the various suburbs of Germany to bring in old or new shoes, clothes and blankets. Toiletteries and donations in the form of money no matter how small will also be accepted. The donations will then be tendered in to the Embassy of Sierra Leone in Berlin to be transported to Sierra Leone. Items can however be brought to our offices at Wandsbeker Chausee 15, 22089 Hamburg, Germany. To love is to give and in giving,younreceive a blessing. Sierra Leonian Embassy in Germany spoke to TopAfric on Wednesday, 23rd of August, 2017 on our airwaves. The interview focused on the TopAfric Initiative that was launched on Monday, 22nd August,2017 and how the Embassy was willing to support the idea. We also had the presence of Madam Latoya Oloruntoyin Manly-Spain and Mr. Foday Touray both nationals of Sierra Leone, join us in the studio on the issue. As the interview commenced, the spokesperson, Mr. Umaru Sahid Jah, Information and Communications Attaché at the Sierra Leonian Embassy in Germany, confirmed that the Embassy is currently receiving donations and financing the transportation of these items to Sierra Leone. * That currently, there are 5,905 survivors in Sierra Leone who needed to be taken care of. *That although Sierra Leone was receiving massive support in various forms from various humanitarian organisations and other institutions, they were still welcoming every and any help anyone can give. *That some of the items needed urgently included ; mosquito nets, blankets, mattresses, raincoats, rainboots, water purifiers, tents, facemasks, toiletteries, mega phones, Anti-malaria drugs and many more. Mr. Sahid Jah in his final words, encouraged the African community in Hamburg and beyond to come out and join hands with TopAfric on this humanitarian mission. TopAfric would like to thank Madam Latoya and the Sierra Leone committe in Hamburg who have pledged their support to this course and welcome any individual or group who will voluntarily join in the collection, packaging and transportation of the donated items we are yet to receive. Donate for a good course as this could happen to any country. To love is to give and in giving we recieve a blessing. God bless you all. If you missed the interview, please visit our Facebook page ''TOPAFRIC'' for update on the information given by Sierra Leonian Embassy in Germany with reference to the situation in Sierra Leone now. The demand for films from NOLLYWOOD is not only great in Africa, but also in America and Europe. Many people are enjoying the films. The films make it possible to unite young and old, as they focus on life in Nigeria from yesterday and today. Many of the Africans and Afro-Germans living in Germany would like to have the opportunity to experience NOLLYWOOD films in German cinemas. But the only way they can see the latest Nolly wood movies is through DVDs. Grace Evaly of Nollywood Germany is creating a way for brand new NOLLYWOOD movies to be shown at least once a month in selected cinemas in Germany. Through her good contacts with the industry, she can receive the latest and most popular Nollywood films. The films are mostly in English, but plans are in place to provide German subtitle to make it accessible to a wider audience. Depending on the success, filming is also planned where NOLLYWOOD stars can be invited to come and shoot in Germany. Grace Evaly was born and raised in Lagos, Nigeria. Already during her school years she played several roles in TV commercials, music videos and magazines For ten years (1996 - 2006) she worked as an actress in Nigeria and worked in different projects of the film industry of Nigeria which is known worldwide as NOLLYWOOD. In 2006 she came to Germany for the first time to take part in a film making. Then in 2007 she moved to Hamburg. 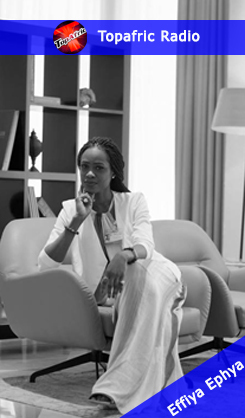 Her goal is to unite cultures and generations through cinema and film and to also provide an insight into the life of Nigeria from yesterday and today. On Saturday, May 20th, 2017, the first Nollywood movie in Hamburg entitled "Zero Deal" will be featured at the Metropolis Kino (Kleine Theaterstraße 10, 22354 Hamburg). The film is about the story of an African who comes to Europe with a visa that is bought at a high price. The film was shot in Germany, Sweden and Nigeria and is filled with well-known NOLLYWOOD actors. One of the actors, Chiwetalu Agu, will also be present at the premiere in Hamburg. Exclusive Live Interview With Afro-Hip Hop Artist "Rebbel Ashes"
Originality and reality is what you get when you listen to Rebbel Ashes' New track. And the video truly portrays what he is rapping about. A lot of young boys dream of having a fling or two with older women. But when the older woman comes knocking on their door, it becomes a dream come true or a reality come true in the case of Rebbel Ashes. Any listener can easily decode what the message of the song preaches. We were fortunate to get an exlusive interview with the Ghanaian Belgium based artist Rebbel Ashes who is originally named Prince Kwaku Sarkodie. Watch the recorded live interview below as Isaac Jr and Ricky Ross had a one on one discussion with him on the show "What's the 411". The ultimate goal is for one or two extraordinary talented kids to have their own radio program at Radio TopAfric. The program is design for kids and young adults between the ages of 10 -21, who want to run a radio program and become stars of tomorrow. It will also teach them how to blog as well. The participant will be glad to be part of this one time experience, after the course, all participants will receive a certificate from TopAfric. The workshop is led by Jesse Georgy, a journalist from NDR, who has experience in team leadership at the Lukukule e.V. As one with the burden of God to bring back sanity into homes, I decided to write this book as a follow up to my already published piece on family titled: “Dismantling family Roadblocks”. It is a must read for every family. I have been privileged to learn and understand a lot about marriage especially African Marriage in Diaspora through counselling and working with families under the verge of divorce. In some cases, there have been success stories while in others, it had been the cases of taking a horse to the stream and not been able to force it to drink water. Marriage is under a serious attack in our present day than ever before. At the foundation of marriage, every marriage enjoys the benefits of God’s blessing and unity but human selfishness, Individual rights, pride, cultural difference play major roles in destroying homes. Among Africans living in an environment in which marriage I believe has being devalued spiritually, socially and legally, couples face serious challenges in their marriages. The house was engulfed in laughter. I however kept what he said to my heart. One of the things to realize these days is that there are normal and abnormal marriages. These when properly broken down might give rise to yet many more terms. In reality however, there ought to be a single form of marriage: “A sanctified institution ordained by the Creator of mankind for the good of man”. In the scenario where there are different forms of it, one is left with just the choice of understanding how far things have deteriorated. This deterioration is largely traced to interferences by various cultures. The term culture, according to the English dictionary addresses ideas, beliefs and customs that are shared and accepted by people in a society. Hence, it should be understood that it is something transferred from generation to generation. Broken By the Binder is an eye opening Book aimed at highlighting how our inability to blend the various cultures has hampered our efforts. Shattered dreams on one side, broken lives on the other! What about the toll of all these on our future hope: Our Children? It is time to do something and salvage our homes. The time is now! Tomorrow may be too late. Go get a copy today. Give it as a GIFT to a family and allow the Holy Spirit to illuminate the eyes of men and women on how to add honey to our moon using the contents of this divinely inspired Book. Why do Africans Think It is Cool To Be Late?